Pregnancy is an exciting time for any parent. One challenge is finding healthy desserts that satisfy your cravings without causing harm to your baby. Taking time to prepare for the inevitable cravings you will face when you are pregnant plays an important role in your child’s development. You do not want to eat foods that harm an unborn child or contribute to the development of allergies. Fortunately, there are options to help with dessert cravings when you are pregnant. A common craving when you are pregnant is ice-cream, and you’ll likely desire the sugar-filled, full-fat version of the treat. A part of this craving stems from your body’s need for sugar to maintain a stable blood glucose level. Satisfy this craving by reaching for a non-dairy ice-cream or sorbet. You will satisfy the craving without the lactose or the high level of sugar. Since lactose is hard on the body, you’ll want to limit your intake when you are pregnant. Fresh fruit helps with two goals: it satisfies the craving for something sweet, and it nourishes your body and your baby. You can enjoy a mixture of fresh berries, a fruit salad or any other fruit combo that appeals to your taste. If you are struggling with nausea, then consider grapefruit or other citrus fruits as a dessert option. 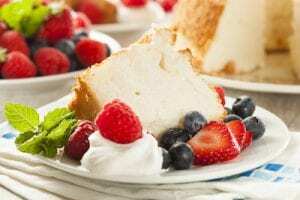 Angel food cake is a great treat, at any time. The cake is light and low in sugar, so it helps satisfy any cravings for cake you may notice when you are expecting. It also does not contain any butter, so it is a low-fat dessert option. Top off the cake with fresh berries to add to the flavor. Dark chocolate is a good choice when you are expecting. It contains a high level of antioxidants and low sugar content. It also has a much lower level of milk or dairy compared to other chocolates. Ideally, you’ll want to opt for 60 percent or more dark chocolate. If you are unsure about a particular brand, focus on brands that actively state the percentage. Keep in mind that a darker chocolate has more health benefits while still satisfying the craving for chocolate. Zucchini bread is a naturally sweet and healthy alternative to traditional cake that helps with your cravings and cuts back on the sugar content. Since zucchini is the main ingredient, you will get a healthy dose of veggies along with your dessert course. By making the bread at home, you will also have the option to use whole grain flour or alternative gluten-free flours to increase the health benefits. 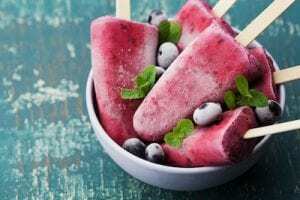 A fruit pop is a great alternative to ice-cream or other sugary treats. Juice your favorite fruit, such as strawberries, mixed berries, or even oranges. Freeze the juice in ice cube trays, a specialized reusable pop tray, or a similar solution. When you feel a craving for something sweet, reach for the fruit pops. It contains only natural juice with no added sugar, fat, or unhealthy ingredients. A parfait is a great option when you are expecting. The treat contains layers of granola, fresh berries and yogurt. Instead of sweetened low-fat yogurts, use plain Greek yogurt to increase your protein intake while taking a step back from those unwanted added sugars. Dates are naturally sweet and healthy desserts. This simple dried fruit is relatively filling and contains a reasonably high amount of sugar, so you’ll want to eat only a few for dessert. The good news is it only takes eating a couple to reap the benefits of fiber and other nutrients contained. Gluten-free brownie bites take advantage of the health benefits of dates, cocoa powder and walnuts. It does not require any cooking. You just combine the dates, cocoa powder, walnuts and vanilla extract in a food processor. You can also add spices, like cinnamon or even pumpkin spice, to enhance or change the flavor. Roll the batter into small bite-sized treats, and put them into your fridge. Enjoy the treat when you want something sweet. 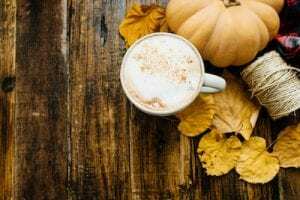 If you enjoy coffee, then a pumpkin spice latte is a good treat to help you get cozy colder weather. Use decaf coffee for your latte and almond or coconut milk instead of cream. Blend the coffee and your choice of healthy milk before you add a pinch of pumpkin spice. If you decide to add a sweetener, then consider agave or stevia instead of sugar. Expecting a new baby doesn’t mean you have to give up on sweet treats. The key to managing your cravings without feeling guilty or risking your infant’s health is finding healthy alternatives to your favorite desserts.